Print Size: 11 x 14 Inch Photographic Print. In Stock, shipped within 1-2 days! The Story...It was a cold December day, 2017 and I was out with my Canon Camera looking for some remaining fall colors. 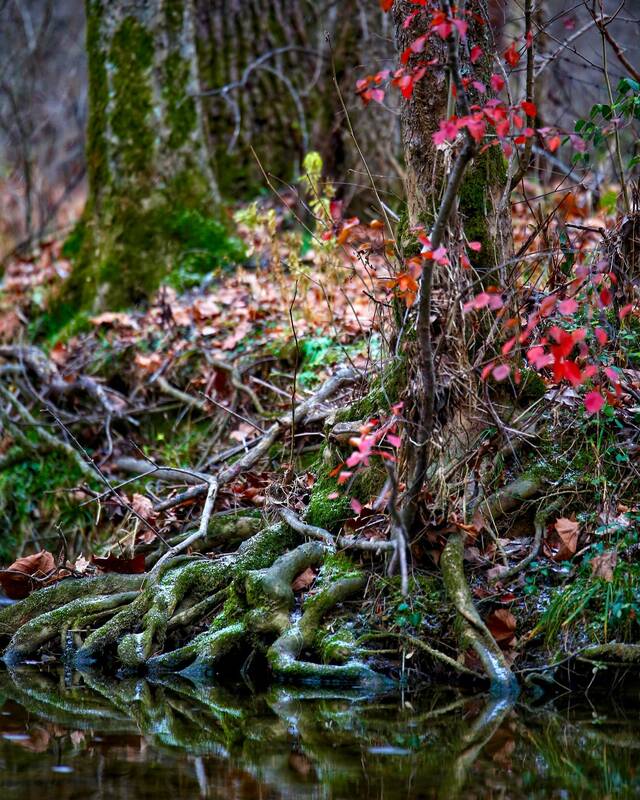 This image was taken while I was wading down the shallow Caney Fork Creek near my home. I titled the photo "Scary Woods Along Caney Fork Creek" since the roots of the tree and darkish background appearance lends to a rather enticing, albeit enchantment look to it, with just enough beauty to it to lure the wanderer into the woods! About the photographer. Full time woodworker here, but when the weekend rolls around I head out somewhere in Kentucky looking for photographic opportunities. My main interests are in landscape, nature, architectural...but... pretty much anything that catches my attention will stop me in my tracks! Pictures will be printed at the highest quality resolution, however, for display here on Etsy they are displayed at a LOWER resolution, so please keep that in mind when your viewing on your computer or device. The printing company I use processes the print with the finest paper and is recognized in the industry as a top printing service company in the country. Your print will be professionally & directly shipped from the printing company to your door usually within 3-5 business days, or 1-2 days from my home if I have it in stock. If you desire a quote on pricing of sizes not listed above, canvasses made of the image or just have questions feel free to contact me. Images are copyrighted material of R.Ellis photography and intended solely for personal use. Other usage such as commercial use, printing, copying, digital manipulation, copying & pasting etc., is prohibited without permission.